At the end of Japan’s feudal era, a group of 13 assassins (some but not all of them samurai) unite on a dangerous, potentially suicidal, mission. Their mission is to kill an evil lord whose sadistic actions threaten to plunge the country into war. I am going to be honest and state right here that I had to force myself to watch 13 Assassins. I just didn’t fancy it and didn’t believe that I would enjoy the film. However, I was so wrong. (This happens a lot - have you noticed?!) I actually really enjoyed this movie. It has some truly wonderful characters and, in the end, I was rooting for every single one of them. There are 13 assassins in total and the film’s second job (after setting the scene by showing us how sick the evil Lord Naritsugu is) is to gather everyone together. Themes of loyalty and honour come up time and again, as does their willingness to sacrifice their own lives for the greater good. Once the group of 13 are assembled (and I did find myself counting the men to see how many assassins they still had to enlist!) they have to find a way to kill a man who is powerful enough to surround himself with hundreds of soldiers. The last half of the film looks at how they attempt to do this with the final 45 minutes involving back to back fighting. It is a tribute to director, Takeshi Miike, that I always knew what each assassin was up to and that the film didn’t feel overwhelmed by its characters. 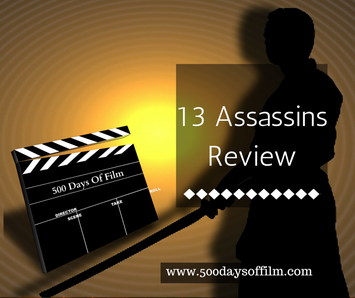 The 13 assassins find that the odds are never in their favour. However, the inventive way in which they approach their difficult mission certainly makes for an extremely entertaining film. Definitely the longest fight scene I have ever seen! Some of the scenes at the beginning of the film are a tough watch. The film needs this, however, as it shows just how cruel Lord Naritsugu is and why the assassins believe that the only option is to kill him. There is a lot of violence in the later stages of the film but none of it graphic or lingering.